вЂў 4-door (see page 20-17) вЂў 2-door (see page 20-12) 2. Remove t h e bolt (A). Then lift the speaker straight up to release t h e lower clips (B). If you pull the speaker out too far from the door, you will damage the lower clips. 3. Disconnect the 2P connector (C), and remove the speaker. 4. Measure the resistance between the terminals No. 1 and No. 2. There should be about 4 O. 5. Ifthe resistance is not as specified, replace the door speaker. 1. Detach the clip (A) and remove the front door tweeter - cover (B). Then disconnect the connector (C). 2 . Measure the resistance between the front door tweeter 2 P connector terminals No. 1 and No. 2 . There should be about 3.3 . 3. If the resistance is not as specified, replace the front door tweeter. 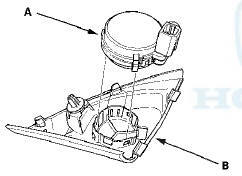 Remove the front door tweeter (A) from front door tweeter cover (B). 1. Detach the clip (A) and remove the front door tweeter cover (B). Then disconnect the connector (C). 2. Remove the front door tweeter (A) from the front tweeter cover (B). 3. Check the capacitor condition. If any malfunction is found, replace the front door tweeter. 5. If the resistance is not as specified, replace the front door tweeter. 1. Remove t h e rear shelf (see page 20-128). 2. 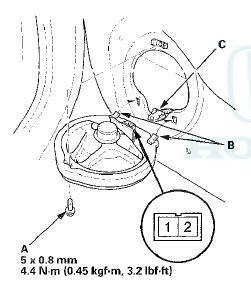 Remove t h e mounting bolt (A), then tilt the speaker forward to release the front clips (B). If you pull the speaker out t o o far from the rear bulkhead, you w i l l damage the lower clips. 3. Disconnect the 2P connector (C), and remove the rear speaker. 4. Measure the resistance between the terminals No. 1 and No. 2. There should be about 4 . 5. If the resistance is not as specified, replace the rear speaker. 1. Remove the rear shelf (see page 20-128). 2. 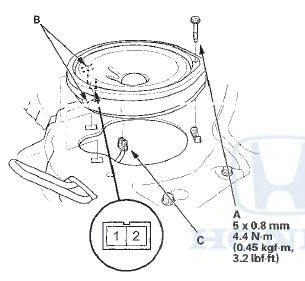 Remove the four mounting bolts (A) from the subwoofer (B). 3. Disconnect the 2P connector (C), and remove the subwoofer. 4. Measure the resistance between the terminals No. 1 and No. 2. There should be about 2 O. 5. If the resistance is not as specified, replace the subwoofer.